It was a few hours before we were to check out of the hospital, and we were drowsily watching the tug boats on the East River out our window, Huck and I, as storm clouds blew past in the sky. My mother's flight from Portland was delayed by those heavy clouds, and I was wondering whether we would get pizza for dinner when she finally landed, and as I thought about clouds and pizza I stroked my lips softly along the top of this warm, brown, fuzzy head--this brown fuzzy head that somehow belonged to me--inhaling his soft baby scent, feeling like every muscle in my body was smiling. The clouds suddenly parted above the river, and out peeked the most brilliant rainbow. 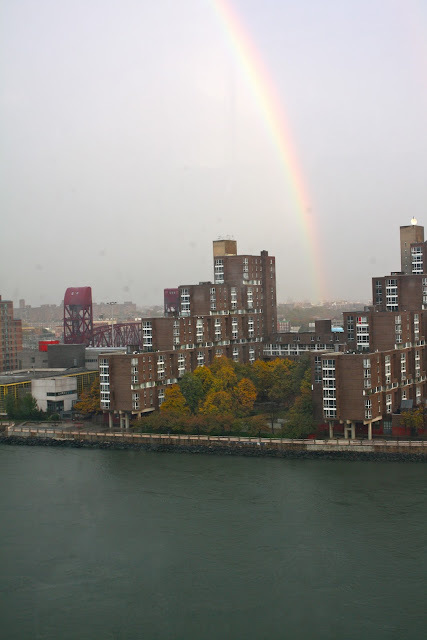 It arched from Roosevelt Island, over our little recovery room at NY Presbyterian Hospital, to some unknown rainbow's end, like a fulfilled promise. Just the day before, as I labored to deliver my own fulfilled promise, my mom texted me to tell me that the Portland skies were filled with rainbows, for my Huckleberry friend and me. And now the rainbows had come to New York. And as I looked down at that brown fuzzy brown head of mine, under that bright, beautiful rainbow, I thought I could hear the Spirit whisper to me that he was mine, and that he'd been saved just for me. That I was made to be his, too. Baby Huck, it is so good to see you. We have been waiting for you for so long. What an unbelievably beautiful post. Welcome, baby Huck! So beautiful. Congratulations, and I wish you all the happiness in the world with your perfect little Huck. We just had our first baby six months ago(!!! how has it possibly already been six months?) after waiting and wishing and hoping for her for almost 4 years, and thinking it was never going to happen. It doesn't get better than being a mom, I hope that you enjoy every minute of it. I love his middle name, and the story behind it. It brought tears to my eyes both times I read it. Your baby is beautiful. I started reading your blog when you were having trouble concieving and to see this, well this is absolutely amazing. I love the middle name that you picked! The whole name flows together beautifully! I've always loved the name August because in elementary school a boy I knew had that name. So baby Huck is just a cute nick name then? wheeeee i do love him, and you, and your holbsmonster. one day i will have my own, i will. Oh Natalie- tears filled my eyes reading this post. Because, I can totally relate. And, isn't it just so strange, this new person Huck has made you? Isn't it so beyond this earth? And, its like all the stars were in line and the world stopped moving. The taxis stopped, the lines at the coffee shop and bookstore stopped, the bills stopped, phones...everything. And, he was BORN! And, YOU did it! Oh what a joyful time. Thank you so much for sharing. I know the prayers in your heart have been joyfully answered. MUAH! Love ya!!!!! I'm also tearing up. I am so happy for the three of you. He is everything you ever dreamed. Way to go lady!!! You did it!! Those Holbrook boy babies sure take a long time to arrive (2.5 hours of pushing for mine)! I'm soooooooooooooooooooooooooooooooooo ridiculously happy for you. Love from NC! Awe! Congrats Natalie! What a wonderful gift! Doing a bit of a choke up here at work. But I couldn't have resisted a photo or two of the net's newest it boy. So happy for you! He's beautiful! I honestly teared up a little bit reading this... the post about August, and the rainbow, it's way too much! BEAUTIFUL! Thank you for sharing this beautiful moment. You give me hope that soon it will be my turn too. there's nothing like falling in love with your very own newborn baby! fulfilled promise, indeed! i have tears and chills just thinking on it. and i'm so so thrilled for you. He is so beautiful! Congrats again. Tears of joy for you, dear Natalie, and your little Huck who finally has appeared. *HUGS* Blessings abound! Congratulations, he's absolutely beautiful. Funny thing, we've been holding onto that same name but reversed--hoping for a baby boy, what a great choice! Beautiful, beautiful post. Perfect for such a beautiful baby. And that song? My all-time favorite. Congratulations, again! Congratulations, a thousand times! He's picture perfect. I'm so happy for you! I'm relatively new to your blog, but I just finished reading from the beginning, and I know now how much this precious bundle means to you. I'm sure you're already the most wonderful new mother. This post is so heartwarming. Thanks so much for sharing moments of your lovely life with us--you make me very, very excited for the day I become a mother as well! I'm so happy for you Natalie! And what a gorgeous post....I'm totally crying my eyes out and kissing my own little boy's head. Natalie, you are an ambassador for childless-women-who-wish-we-weren't. Thankyou so very much for your compelling, honest writing that makes the waiting easier for the rest of us - it is a wonderful gift and reading the comments here I can tell you touch the lives of many. You truly deserve that sweet little baby and I wish your family all the joy in the world. Beautifully written and yes, a gorgeous gift from our awesome God. So happy that Huck is here. Wishing you the best for your sweet fam. Congrats! He is perfect! He's gooooorgeous! Congrats Natalie! Welcome to Mommyhood. Rainbows in Brooklyn, too. Great photos, and all the best wishes for your little family. Oh, you just made me cry. How do you manage to sum up those feelings so brilliantly & concisely?! Your little rainbow looks perfect. The extra years you spent waiting for him will make him that much sweeter, believe me. Aww he's adorable! Congrats again, and i absolutely love his name. What a perfect post, for a perfect day, about a perfect boy. Congratulations on your new baby son! Tell your mom I said hi Christeena (foote) Montierth. She was one of my yw leaders in mesa. What a beautiful post! I love his name! Wow, I wasn't intending to cry this morning...I already have make-up on! What a beautiful way to start the morning. I am so happy for your little family. Enjoy your new present from heaven! I'm CRYING over here. He's just beautiful Nat. I'm so happy for all of you. Such a beautiful post! Congrats to the Holbs-trio! enjoy your little man! Welcome to the world! Congratulations Momma! Natalie, thanks for this post. I am 13 weeks pregnant and have really been struggling with thoughts that I just can't do it (this will be my 4th in 6 years)...I really wanted another baby, but once it happened I've kind of freaked out a little..and I am hoping it is just hormones. But, reading this post made me remember that Heavenly Father has immpeccable timing and these sweet little spirits that become our children have a purpose and a plan and it really will be just fine. I probably sound like a raving lunatic, but a dusty old light bulb flickered when I read this post, so thank you. Your little Huck is adorable and I am so happy for you! Congratulations! Gosh we've all been waiting so long. Welcome Huck!!!! I don't even know what to say to you right now - other than YAAAAAAY!!! I LOVE the picture of you getting him, and didn't even have to watch the Audrey Hepburn video to make myself cry. We're so happy for you...and for the Holbsdaddy...and, of course, for Huck. Welcome to the world, little man!!! GAAAH...he's beautiful! And I'm tearing up, all the way in California, with happiness for you. Congrats! a little friday morning tearfest on the blogs. but happy tears. HUGE congrats. I'm so happy for you. this made me so teary-eyed. congratulations. Is it creepy to say I love him? It's creepy, I know it is, but I've read you for so long now and having done that, it's just so good to see that ache fulfilled and to see him born, and to see your face seeing his for the first time... it's hard to not have an emotional burst of love in your general direction. :) I'm just so happy for you all! Congratulations, Natalie!!! He's beautiful and wonderful and precious and everything a baby should be and more. Oh, and one handsome little devil. His grandpa Randy should be proud. By the way, baby scent is the best smell in the world! I'd forgotten all about it by the time Tamsin arrived, and for DAYS we couldn't stop sniffing her tiny fuzzy little head and remembering Camryn as a baby. It's intoxicating, really. Yay again! The Taylor family has been hoping and praying for you for so long. We're so glad your little boy came home to stay. Give your mom a hug from my mom and tell her that, according to Karen, being a grandma is the best thing in the WORLD. This gave me chills! I'm glad he is finally here with you... healthy and happy! Good work.. he's a beauty!! Okay, one more comment and then I'll stop gushing like a loon. I LOVE the middle name you chose. I didn't get the meaning of it at first (although I figured there must be), but then I reread that older post you provided the link for, and I nearly cried. It's just so perfectly perfect. You and your Holbsy are just too adorable for words. Dreams really do come true! He is beautiful! He is so beautiful! What a wonderful memory to pen of your first few hours together. You will make a great mama. I haven't commented in quite awhile, but I had to say what a beautiful and poetic choice for his middle name. I totally see the symobolism! Your Holbs did a great job of capturing the look on your face the first time you saw Henry. I am also amazed how your nurse could have been your long-lost sister, she definitely looked a bit like you. I wonder if anyone else noticed that? You two made one cute kid; good work Nat and Holbshusband! He is all that could be imagined up and hoped for. Congratulations! And, may I say, what a beautiful name for your baby boy. Yay for the Holbrooks and Lovins!!! The BEST!!! Congrats..he's absolutely perfect! Nat, you have a baby! He's beauuutiful! And your little song post there made me tear up. Could you have picked a more perfect song? I wish the three of you ALL the rainbow happiness in the world! ...a perfect story. He is so handsome! And I will tell you a secret. He was born on my birthday, which is to say that his cool demeanor might belie a certain feistiness, possibly... Yay for your scorpio boy! OMG, insert tears here... so very happy for your family. Enjoy it all! I had to chew the inside of my cheek to keep from bawling when telling Karl, my mom, and Katie why Henry's middle name is "August." So, so sweet. Amazing story, you've captured the beautiful transition into motherhood so perfectly! He's absolutely gorgeous! Congratulations! Oh Natalie what a perfect post to herald the birth of your sweet Huckleberry! I'm so happy for you. He's awesome! A perfect addition to your family! Oh, LOVE!!! i thought i was anxious for baby Huck to finally be born, but it must've been completely different for you ! Moon River is one of my favorite songs also, so just all around, you touched favorites in my heart. Oh....I'm so happy for you and your baby Henry! I'm literally crying over here! You're going to be a great mother Nat! Loads and loads of love and wishes!!!!! He is the most adorable thing I've ever seen. Congrats!!! I am so incredibly happy for you. And baby Huck is just too perfect for words. He's gorgeous! I'm so happy for your family. Loved your words of gratitude. Thank you for sharing. OH BEAUTIFUL pictures. I love him :) good job. Yay!! Beautiful! Congratulations to you both- Thank you for sharing all of your adventures! Cheers to more to come! And your baby is AMAZING. And so are you. I've been reading your blog for a long time and I never comment, but I loved this post. I'm so happy for your family. 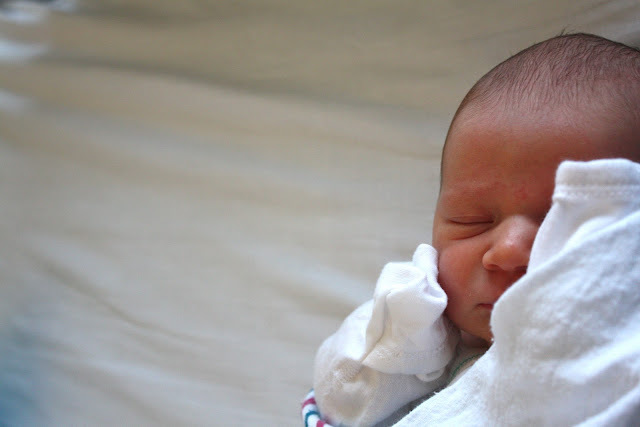 I LOVE baby holbrook's name and the story behind it! Congrats! Beautiful baby and you are a wonderful writer. So glad I stumbled upon your blog. This is hands down your best post, and I go back to read it every now and then. It just sums up so much love, patience to have your baby and the empowering feeling of becoming a Mom with a little baby. I don't know why, I just love it. Thanks for sharing. I am so sad to know you circ'd. What an awful thing to do to an unconsenting baby boy so new to this world. This is my favorite blog post, maybe ever. I've only been a reader of your blog for about 2 years now, and I love reading your archived posts on occasion... "old" words by date, but "new" to me. Finding a post that I haven't yet discovered is always a little bit like Christmas for me. And as I make my way through these old posts, searching for something new to read, I always come back to this post. Beautiful isn't strong enough a word to describe it.